The exterior is Queeen Anne while the interior is of many different styles. The home was recently renovated to its original grandeur. 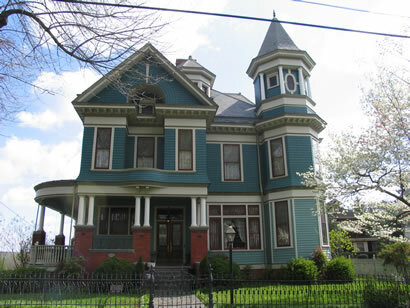 The house was built in 1898 by architect E.G. Frye for George Watkins, president of the Lynchburg Plow Company, later the Lynchburg Foundry Company. The Watkins family wanted a more elaborate house than its next door neighbor at 412 Madison Street, thus the economical frame construction outside and the more elaborate, expensive interior. The trellised east porch was later added to accommodate another second floor bathroom.